More than 90% of malware uses DNS at various stages of the cyber kill chain to penetrate the network, infect devices, propagate laterally, and exfiltrate data.1 According to recent surveys, 46% of respondents experienced DNS-based data exfiltration and 45% experienced DNS tunneling.2 Malware and data theft are pervasive largely because conventional cybersecurity solutions are not designed to protect DNS. 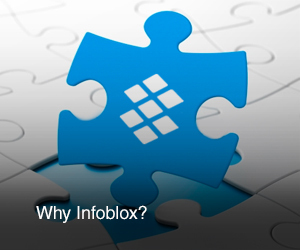 With Infoblox, you can deliver on all three and much more. With Infoblox, your organization can automatically detect and isolate malware before it can spread and safeguard sensitive data from exfiltration. Protect devices everywhere—on premises, while roaming, in remote offices, and branch locations—by making DNS your first line of defense. With Infoblox, you can shut the door on malware communicating through DNS. Our solution combines curated threat intelligence, reputation, signatures, behavioral analytics, and advanced automation to prevent communications with known malware and malicious destinations as well as zero-day threats. Available as an on-premises solution or a cloud service, it proactively contains malware such as phishing, ransomware, and more, while blocking command and control (C&C) communications at the DNS choke point. Moreover, it stops the lateral spread of threats by automatically sharing DNS indicators of compromise with security ecosystem tools such as next-generation endpoint protection (NGEP), Network Access Control (NAC), vulnerability scanners, and security information and event management (SIEM). One of the most common uses of malware is to steal data. The route that is most often left open and under-protected is DNS, a fact well known to malicious actors. They rely on DNS tunneling and other sophisticated zero-day methods to exfiltrate data using DNS queries. Infoblox detects and automatically blocks attempts to steal data via DNS and evade traditional security controls. The solution applies signature, reputation, and advanced behavioral analytics that leverage machine learning to detect not just known DNS tunnels but also zero-day techniques that often unfold over longer periods of time. With Infoblox, you get centralized, end-to-end visibility into infected endpoints wherever they reside—on premises, roaming, or in remote offices. Accelerate remediation with the ability to instantly view details of any asset, including user name, MAC address, device type, and lease history. In addition, you can perform deep analysis and gain valuable context with an integrated threat investigation tool that quickly reveals insights into threat actors, campaigns, and associated breaches. Improve your security posture with historical analysis of DNS, DHCP, and IPAM (DDI) data. With the solution’s centralized reporting, you can harness rich insights from core network data to gain actionable insights, monitor and analyze your network, devices, and applications, and access crucial details on malicious activities and infected devices.